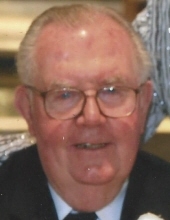 ROBERT J. McDADE, age 92. Beloved husband of Jane (nee Fink) for 63 years. Cherished father of Jane (Patricio Dhimitri), Robert Jr. (JoAnn), Brian, Kevin, and Michael (Mary Kay). Loving “Pop-Pop” to 8 grandchildren and 4 great grandchildren. Son of the late James and Nelle. Dear brother of the late James, Margaret, and Fr. Jack McDade. Proud U.S. Navy Veteran. Passed away Thursday January 17, 2019. Funeral Mass 11 AM Tuesday, January 22, at St. Ladislas Church, 2345 Bassett Road, Westlake. Friends may call in the McGORRAY-HANNA FUNERAL HOME OF WESTLAKE, 25620 CENTER RIDGE ROAD (WEST OF COLUMBIA ROAD) ON MONDAY FROM 3-7 PM. Interment Private. In lieu of flowers the family suggests memorial contributions to The Monastery of the Poor Clares, 3501 Rocky River Dr., Cleveland, OH, 44111. "Email Address" would like to share the life celebration of ROBERT J. McDADE. Click on the "link" to go to share a favorite memory or leave a condolence message for the family.